Chef Thomas Shelley chops fresh veggies from the gardens around him while Nadine Donath plates up the first course. The ‘Farm-to-Table’ concept was first popularized in the US in the 1990s in restaurants in Northern California, in a movement led by celebrity Chef Alice Waters among others. The idea, now embraced by many chefs, is to create a seasonal menu and cuisine that is based on foods that are fresh and currently available from local fields of local farms. Followers of this type of cuisine are often called ‘locavores’. Our ARTfarm-to-Table dinners bring the chefs and guests right onto the farm, featuring ingredients grown within 600 yards of the spot where you’re sitting down to enjoy them. There is a wonderful energy in the experience of fine dining in the midst of a pineapple grove. 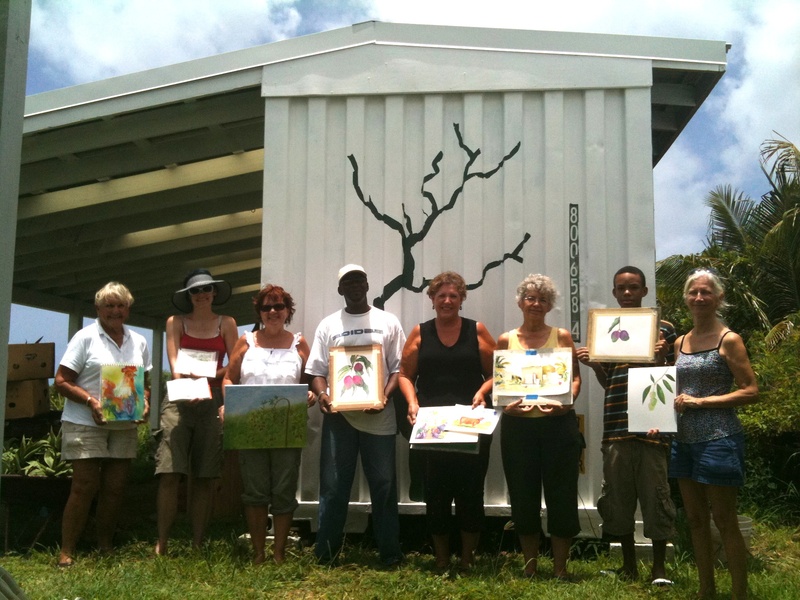 Saturday evening, May 28th 2011, ARTfarm hosted our first ARTfarm-to-Table dinner for nine guests. 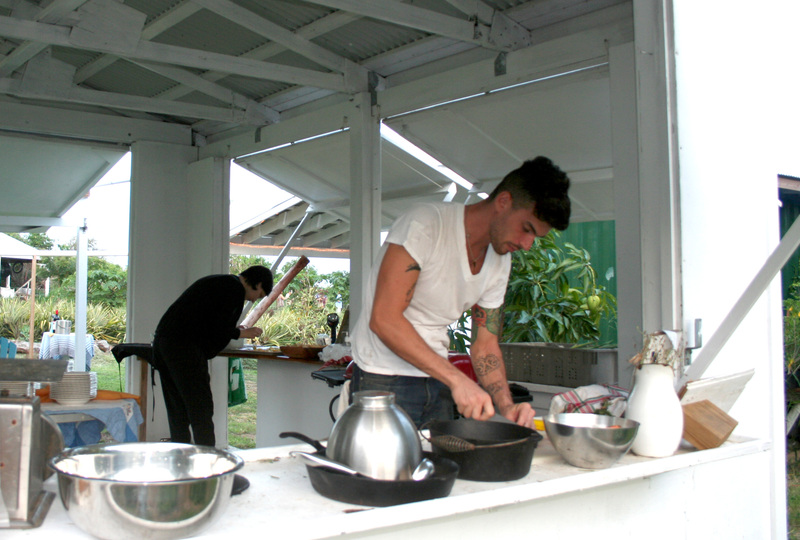 The ombitalented Chef/Artist/Musician/Gallery Owner Thomas Shelley prepared a six course meal for the maiden voyage, assisted by artists Alisha Westerman and Nadine Donath. Yum! A six-course meal at ARTfarm made from ingredients grown in the gardens all around your table. 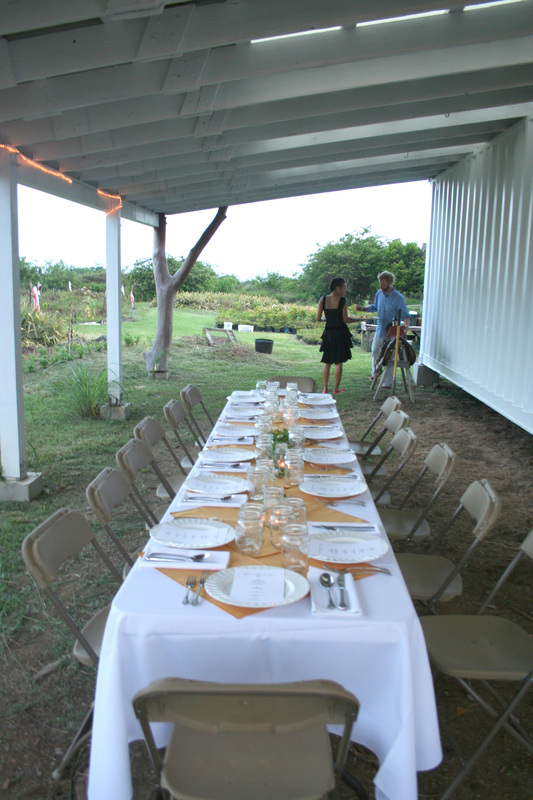 ARTfarm-to-Table dinners can accommodate 24 or more guests. Chef Thomas’ photos of the event are viewable on his Facebook page. The crowd was very happy! Lemongrass (‘fevergrass’) bush tea over ice was a lovely refreshment for a hot night, and Chef Thomas generously included his white-hot Garlic and Tejaswani Indian Hot Pepper Oil on the table for those brave enough to try it. Our next ARTfarm-to-Table Dinner will most likely take place in early fall 2011, as our gardens come out of the summer resting period and begin to produce again. 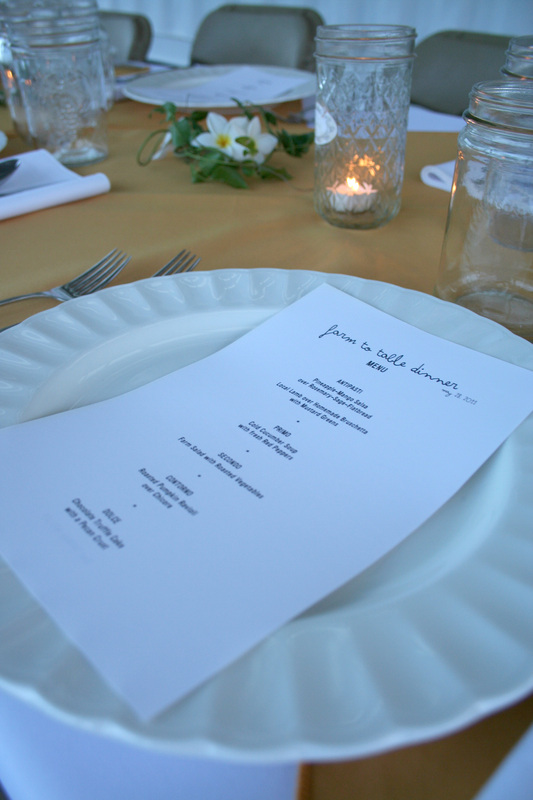 Please let us know if you’d like to be on a guest list for upcoming farm dinners at ARTfarm!